There has to be a little commentary here before the recipes coming up on the next posts because when I am cooking I think of my niece and what she would be doing if she were cooking the recipe herself. To that end, I would like to include helpful hints and details about the recipe and call them Natalie’s Notes or Nat Notes for short. I am always thrilled when she asks for a recipe and I try to give her as much detail that I can possibly muster. When I was a young bride I would call my mother and say, “how do you make gravy?’. “Well, you just take a little flour and a little grease in a pan then add milk,” she would reply. Well, that is correct, more or less, minus a few minor but important details. I am certain that is how my grandmother taught my mother. We all learned by trial and error in the good ole days. Now, I always try to respond with something like: get a skillet, preferably cast iron, put about two tablespoons of oil; get it hot but not smoking; add four tablespoons of flour; stir immediately nd until a light brown. Add water, stand back because the steam will hurt. Then, add your salt and pepper. Make sure your bring it to a bubble or boil before you turn to low. It should be thick. If not, you can add small amounts of water. I prefer brown gravy with water or use milk for white gravy. Without all of those details, I think you should know that my first gravy, served to my new husband, could be sliced like pie. We didn’t have internet back then so back I went to my mother who just laughed and laughed before she relinquished the details. 1. Tomorrow is the big day. 2. If you froze anything to be heated tomorrow, take it out and place in the refrigerator. If you forget, take it out tonight and leave on the counter covered. 3. The turkey must be soft to the touch in the package. If not, take it out of the refrigerator to thaw all day and overnight. I will be taking mine out late tonight to thaw overnight. Look at the weight and determine the amount of time you need for cooking and carving in order to place hot turkey on the table. 4. Have your cornbread already made, sitting out and covered. The history of dressing is the good use of stale bread. If your cornbread is too fresh you will have mushy dressing. 5. Set your table tonight. It takes the stress out. 6. Designate a dessert table or area and have it already set up with plates, forks and napkins. If serving coffee, get that ready with cups in the same area. 7. If you think you will run late on getting the meal on the table and don’t have an appetizer prepared put the relish plates out. Do the relish plates tonight, cover and place in the refrigerator. 8. Someone is always going to complain. Ignore this person. If you can’t seem to ignore him or her, rebuke them in your mind (only in your mind) by saying to yourself, “I rebuke you in the name of Jesus” or “Get behind me satan” works really well. 9. I am sure everything will be beautiful and delicious! 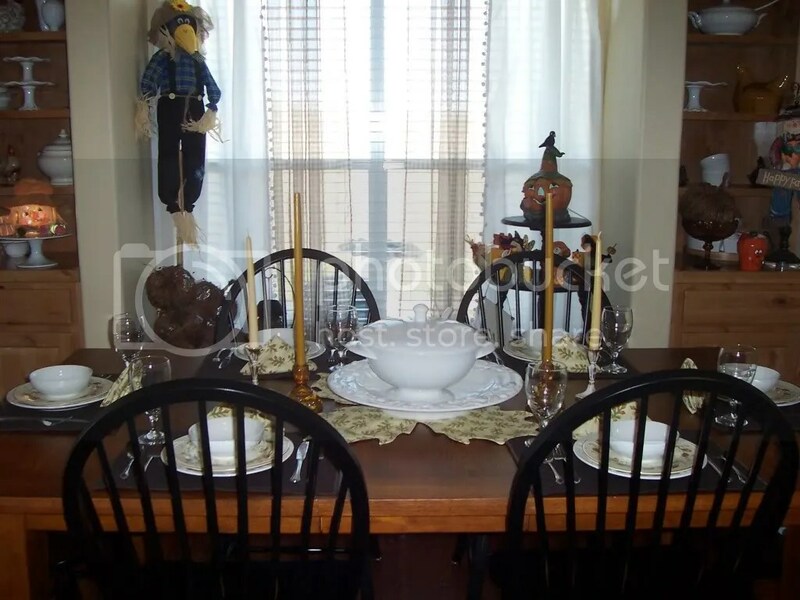 Pictured below is our very humble Thanksgiving table. This year it is just our immediate family of four. For some reason, I sat a table for six and I am thinking it was too difficult to go scale down from sixteen or twenty. Perhaps, God has something else in mind for tomorrow. All are welcome! Previous Post Oops! – To Do List or To Not List?